Digital cameras for microscopic imaging can help dentists get a clearer – and closer – picture of the state of a patient’s teeth. But many of today’s video cameras now capture good, usable still images, and higher-end digital single-lens reflex (DSLR) still cameras can now record video, too. How does a specialist choose between still and video cameras when the line between the two is blurring? And where does the wand-type intraoral camera fit into the mix? For dental microscopy, the type of camera that fits a given need depends not only on the quality required but also on the amount of effort the practitioner is willing to devote to image capture and processing. Courtesy of Dr. Eric Herbranson, eHuman. 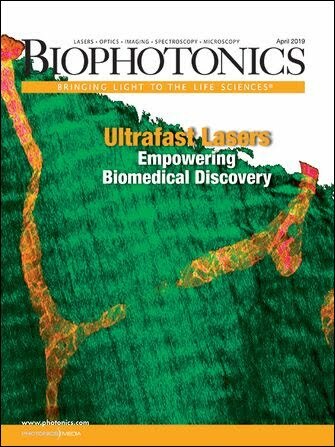 To gain insight into these issues, BioPhotonics caught up with Dr. Eric Herbranson, a clinical endodontist and co-founder of eHuman in Milpitas, Calif., which develops human anatomy education software. He also developed the Xmount (Global Surgical Corp.) series of microscope camera mounts. He has 40 years of experience in film and digital imaging, and frequently lectures on integrating technology into dentistry, using software and computers in education, and imaging with the surgical microscope. 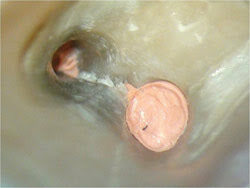 At left: In the pulp chamber of this upper first molar after the root canal has been filled, the pink material is the gutta-percha filling in the tops of the five root canals. 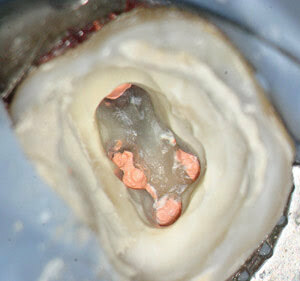 The image was shot with a Canon 500D DSLR on a Global Surgical G6 surgical operating microscope. The camera was mounted to the scope with a 50:50 beamsplitter and an Xmount camera mount. The same image as above, straight from the camera with no postprocessing. 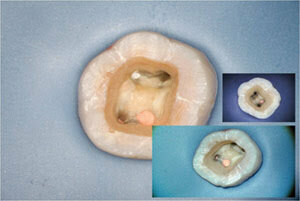 The same tooth as above, shot before the root canal fillings were placed. The image appears straight from the camera with no postprocessing. 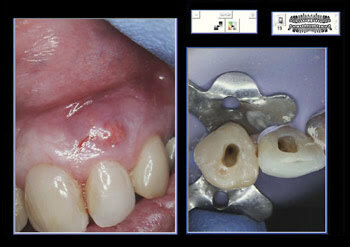 The tooth above, seen in a composite image of the “before” and “after” canal preparation. There are, of course, cameras designed specifically for dental microscopy: intraoral cameras. These are small, with handles shaped to fit inside the mouth. The Kodak 1500, Herbranson noted, is a digital intraoral camera with a 1/2.5-in. CMOS sensor and offers still image resolution of 1024 x 768, video resolution of 640 x 480, an autofocus range of 1 mm to infinity, a 90° angle of view, and integration with digital radiology and cone-beam CT software. But do dentists need special cameras for microscopy? Consumer DSLR cameras and digital video cameras can be used for microscopic imaging, according to Herbranson. It all comes down to why a dentist or other microscopist wants the images, whether for medical or legal reasons, for case reports, for patient education purposes or even for display during lectures. “How good do you want to be? How good do you have to be?” are two vital questions that must be applied to each application, he said. 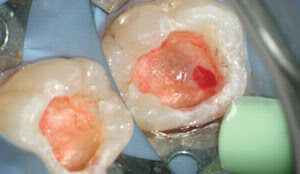 In this mid-treatment image of a lower first molar after decay was cleaned out, the red spot is an exposure of the pulp of the tooth. The image was captured using a high-reflective front-surface zirconium mirror with a Canon 500D DSLR. The histogram is included to illustrate the exposure accuracy of a camera that is properly set up. DSLR cameras, he said, take great-quality stills and video; high-definition (HD) video cameras take great video but only good-quality stills. The quality – and the cost – can vary widely, even within a single manufacturer’s product family. Dr. Herbranson’s practice partner, Dr. John Jaber, uses the microscope. The camera on the scope is a Nikon Coolpix 990. Herbranson named Sony as an example: The HDR-CX520 costs around $1100, and the HDR-CX100 costs $400. For the extra money, of course, you get better features: The HDR-CX520 boasts a 1/2-in. CMOS sensor that captures full HD video at a resolution of 1920 x 1080, 12-megapixel still-image capture and 32-MB internal flash memory. The less expensive HDR-CX100 offers only a 0.2-in. CMOS sensor. Its resolution is the same, but it takes still images at only 4 megapixels and has just 8 MB of internal flash memory. Both are useful for dental purposes, and they interface easily with the dental microscope to record a wide variety of procedures from restorative to endodontics to surgical. 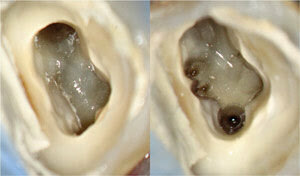 And the dentist can use either the auto or manual focus mode to get the best possible look at the tooth in question. In this composite of three pictures, one was shot with a DSLR, one is a still image from a Sony video camera, and one was taken with a dental intraoral camera. These are pixel-for-pixel representations, and the size difference illustrates the significant difference in the pixel density of the various cameras. For dentists who want to control more than just the focus mode – those who really need to get up close and personal with the images for diagnostic and treatment purposes – DSLR cameras are another option. They can run into the thousands of dollars, though the most expensive cameras are too heavy for the microscope. The less expensive “prosumer” DSLRs have the necessary features and are smaller and lighter. 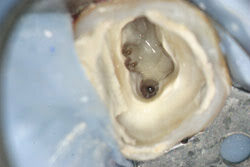 A high-magnification image of the floor of the pulp chamber of the same tooth. This is about 20x magnification – at the upper limit of what these dental microscopes can do. Shot with a Canon 500D, this image would be impossible with the other camera types. It illustrates the very shallow depth of field typical of high-magnification microscope imaging. 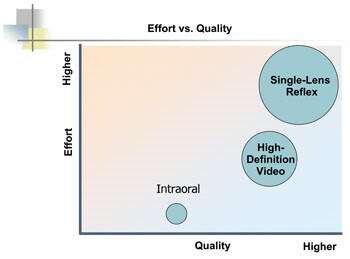 In general, there is a trade-off between effort and quality when intraoral cameras and consumer cameras sit side by side, and there is a progression to that trade-off: Intraoral cameras require the least amount of effort on the part of the practitioner in terms of mounting, use and image postprocessing, but they offer lower quality levels than the other two types. 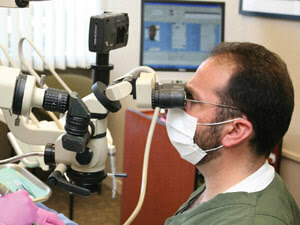 Next come HD video cameras, which create better-quality images but require more finagling than intraoral cameras. And at the top of both the effort and the quality scales are DSLR cameras: The user has to know how to use them – or get some kind of training – but the potential quality of the images is much higher with DSLRs than with the other two camera types. Dr. Eric Herbranson earned his bachelor’s degree in physics and then went on to earn his DDS and master of science degree in endodontics from Loma Linda University, and now is a clinical endodontist and a clinical assistant professor at the University of the Pacific school of dentistry. This “hero” version of one of the same images that was postprocessed in Photoshop is about as good an image as these cameras can produce, according to Herbranson. 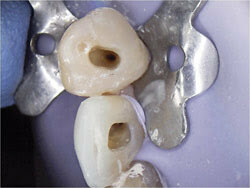 This shows endodontic access preparations in upper lateral and cuspid teeth. He also is a co-founder of eHuman, a company that produces high-end educational programs on human anatomy, especially relating to dentistry. The data-gathering methods that produced these programs include research-grade micro-CD scans (including some work on the synchrotron at the Advanced Light Source at Lawrence Berkeley National Laboratory); MRIs; serial macro-photography done on high-precision, custom-built computer-driven stages; and serial sectioning on custom-built CAD milling machines, which produced color (RGB) volume data sets. Demo videos are available at www.ehuman.com. Q. What do you teach at the University of the Pacific school of dentistry? A. I do the occasional lecture on clinical endodontics to the second- and third-year students. I have also lectured to the graduate students at the dental school at Loma Linda University and at University of California, San Francisco, dental school. I’ve had a long career in lecturing both nationally and internationally on a variety of subjects, including general endodontic technique, tooth anatomy, microscope photography, presentations, aesthetics and technology, and three-dimensional imaging. This screen dump of the software presentation of an image shot with a Kodak 1500 intraoral camera is typical of the quality of these images. Q. Do you dabble in other kinds of imaging (artistic photography, for example), or is your interest solely in dental imaging? A. I’ve had a lifelong interest in photography that started at age 11 (1953!) when I developed my first roll of B&W film. I was the chief photographer for my high school paper and annual, and the chief photographer for my college annual my junior year. I’ve continued my aesthetic and technical development continuously since that time. I’ve done significant work in architectural, interior design, fly fishing, automotive racing and wedding photography. And, of course, dental photography. I’ve been published in a number of national publications. My college BA degree was in physics, so I have a good theoretical background in the science of imaging. Some of this imaging includes macro- and microphotography, for which I’ve built a variety of different custom camera stages. This still image was taken with a Sony video camera using an inexpensive front-surface dental mirror, and represents the quality video cameras can achieve as still cameras. 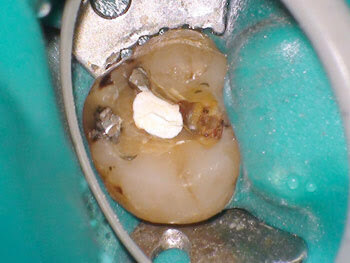 This is a shot of the chewing surface of an upper second molar after an old filling and some decay were removed. Note the faint fracture line in the dentine and in the white cement base filling. These interests expanded into presentation technology. I was the first speaker to do an electronic presentation at the AAE (American Association of Endodontists) annual meeting – it cost me $3000 to rent the projector, and it took the tech guy six hours to set up. Today you are prohibited from using slides. In the more scientific/technical areas, I was responsible for most of the imaging technology used by eHuman in its commercial and grant work. Referring to the bandwidth and spectrum location of the signal produced by television or radar scanning.